A chaplet is a personal devotional prayer that can be prayed privately or in a group, out loud or silently, in a church or in an ordinary setting. It could be prayed on a plane, in a train, on a bike or a hike. It could even be sung with or without musical accompaniment, in Latin, Greek or in the vernacular. There are different types of chaplets, and the two most common are the Rosary and the Divine Mercy Chaplet. Typically, prayer beads (rosaries, chaplet bracelets) of different forms (wood, glass, metal, cloth, rope, nylon, even sea shells!) are used by the faithful to keep track of where they are in the prayer. Often these sacramental items are blessed and people carry them in their pocket or hang them off the rearview mirror over the dashboard in their car. Rosaries and chaplet bracelets — if they are blessed — should be treated with care, even if they are not technically considered sacred. Sometimes people kiss their beads when they pull them out or put them back in their pocket, purse or pouch. Some rosaries even become galleries of saints over time as their owners attach medals of their favorite saints between each decade. Children tend to be very fond of rosary beads and chaplet bracelets, and often receive them as gifts for their baptism, first Communion or confirmation. However, they are not toys, and children who use rosary beads as handcuffs on their little brothers should be corrected, gently but clearly. A chaplet is a vocal prayer and can be prayed as a petition, or in adoration, or for motives of thanksgiving, or in reparation for personal sins or the sins of the nation. Typically, a chaplet follows a set sequence of prayers and then repeats those sequences, commonly known as “decades” of ten or seven repetitions. Typically, there are three, five, seven or nine “decades,” and again the most common is the Rosary, which consists of five decades of one Our Father, ten Hail Marys, and the Glory Be. By nature a chaplet is based on repetition, but if the person prays it with attention and devotion it does not have to be repetitious. Repetition does not suggest lack of originality, any more than Beethoven’s Fifth — which states, repeats, inverts and varies the theme — is considered to be repetitious or unoriginal. Sometimes you hear people criticize devotions such as the Rosary or the Divine Mercy Chaplet for being simplistic and boring because the prayers are very common and repeated frequently. But there is nothing boring about a rose in full bloom, even though every petal in the blossom is just like the next. Down through the ages popes have recommended that the faithful pray the Rosary — every day if possible. That’s what St. John Paul II did, as well as Mother Teresa and Padre Pio. 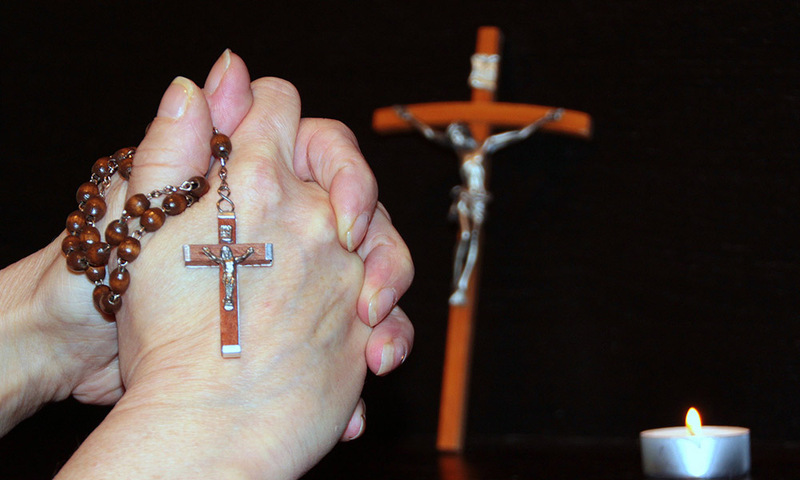 Since a Rosary or the Divine Mercy Chaplet is a personal devotional, it can always be accommodated to fit the need and the circumstances of the situation. Many have discovered that, while the Rosary is made up of simple prayers — the Our Father, the Hail Mary and the Glory Be — these prayers are very powerful. After all, the Our Father (the Lord’s Prayer) was given to us by Jesus Christ himself; the Hail Mary by an archangel, St. Elizabeth and the Church; and the Glory Be is rooted in the Old Testament angelic praises from the Book of Daniel. It would be difficult to improve on those prayers!